Amid evening rush, the horrible news became clear: Frager’s Hardware on Pennsylvania Ave SE was ablaze. 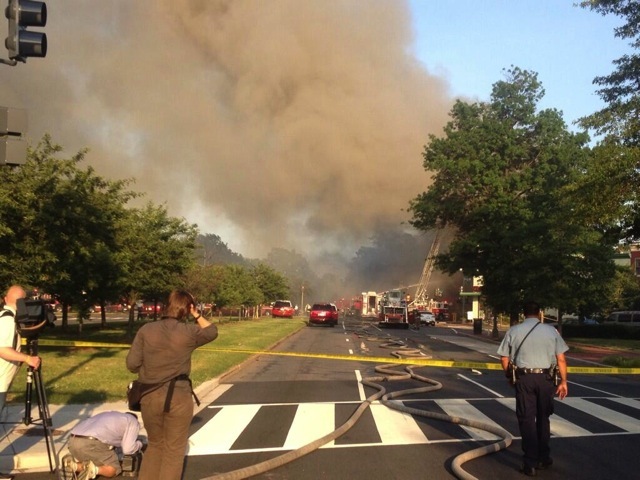 The fire, classified by DC Fire & EMS as a four-alarm fire, has over 100 firefighters on the scene. Multiple DC FEMS tower trucks attempting to put out the fire. Likely lost are the Frager’s Hardware Store facing Pennsylvania Avenue, as well the Frager’s paint store behind the main building. The 93-year-old hardware store has been a pillar of the Capitol Hill community, and a massive resource for the community. Thankfully, the damage to Frager’s doesn’t include its staff. Owner John Weintraub reported to Charles Allen, chief of staff to Ward 6 Councilman Tommy Wells, that all his staff escaped unharmed. Frager’s isn’t the first Hill icon to suffer a major blaze in recent history. The Tune Inn suffered a kitchen fire that closed the famous pub for a number of months in 2011. In April of 2007, a horrific fire gutted Eastern Market’s North Hall. Both were rebuilt with significant support from the city and the Capitol Hill community. I suspect that Frager’s recovery will be similar. The fire is, at press time, still not contained, and the IAFF local 36 suggests that this will be an all-night affair getting the flames in the paint store down. Smoke from the fire was visible from throughout DC, from nearby Nationals Park to as far northwest as Tenleytown.